Father’s Day is just around the corner. Do you have your Father’s Day present? If you’re like me and a total last minute shopper I got you covered! 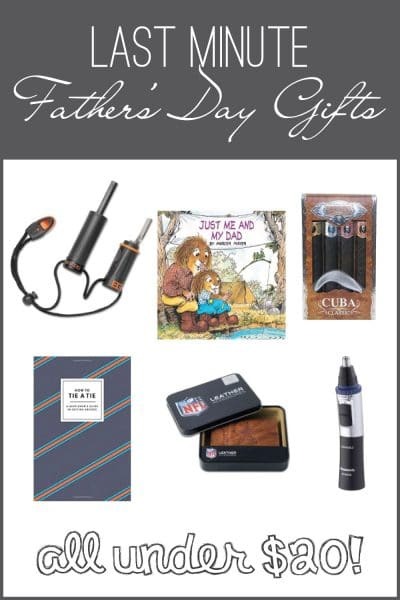 Check out these last minute Father’s Day gifts that can be purchased using Amazon Prime so you can get it before the big holiday! Let’s put that prime account to good use, friends! Need something from baby? Check out this adorable book, Just Me and My Dad. Or maybe this book from an older child. Or maybe your hubby needs a reminder on how to tie a tie for those rare times you get to go out just the two of you. Or maybe your dad is an outdoorsy guy or needs to feel manly, get him this handy Bear Grylls fire starter kit. Grandpa got some nose hairs getting a little long? Or maybe those ear hairs are starting to peek out? This hair trimmer is less than $20 and can be on your doorstep in two days! Now that all the kids are out of the house, maybe your dad enjoys sitting down with a nice Cuban cigar. Or maybe he would if he had one. Here’s just the thing to get him! Or maybe he’s more the sportsy type and can’t wait for football season and needs a little pick-me-up to hold him until the season rolls around? Get him this leather NFL wallet to keep his money safe. Father’s Day is a tough holiday! But I hope this helps you get thinking and maybe gives you a few ideas for some last minute Father’s Day gifts. What are you giving your dad this year?